CHANNEL message received on Sunday morning 31ste December 2017, it is from the four beautiful assigned helping angels, a gift from Archangel Michael. With assent I call them for this the 4 A’s, their names begin with an A. 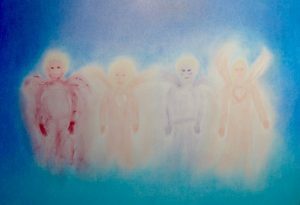 First to give explanation about these four beautiful angel beings, they were offered by Archangel Michael for the first time in a message in July 1996 channelled by Ronna Herman. The explanation according Archangel Michael is, you, me, everyone, we have to ask for it, I did it, about two years ago, since that moment they are with me en they assist with every striven, by words of Archangel Michael – there is no limit to what they can do! There is a condition; it has to be for the Highest Good of All. It are dear beloved Heavenly warriors, they are there for us as a gift, at his request. There are two of male energy and two of female energy. The first action was to ask their names and to get in more near contact and to step in more and closer connection with them and to stay that way. And to recover the bond, dear readers they miss (missed) us, because of the process of refining are we as humans become more accessible and more receptive for Higher Communication with and from the Higher Realms with our dear beloved ones over there. As anyone who is reading about spiritual, alternative messages, there are quiet a few number of people who have “contact in their own way” and whether or not pass it through and share, but with each other we stepped, landed on a ascending spiritual path and there is action! Via enter the inner, the following has passed on by these four angel beings, the 4 A’s. This is the first message of this nature from them with a purpose that became clearer in the course of the event. There arose a sphere like not before, if, there is a look at me, noticeable in energies. I say hello, love and blessings. Silence, but it feels great. And them I become aware it is more than one, it becomes clearer, they are angels and there came the hands….. Reaching out to me and then you do it too, energetic touching, WOW! Then started the communication, “We are the four Angels, helping Angels from Archangel Michael and we are coming more closer now, more then before. Then the connection improves and you notice how brilliant they are as beings and they really feel powerful. Then comes through, we had to reduce our radiation; otherwise it would be too overwhelming in this now. I say, okay, very understandable. 4 A’s: We really love being together with you and working together, with all the love. 4 A’s: We have come on this day to inform and to show how the closer we have come and this will continue and strengthen. The message is also about that a lot is about to happen. We know you want to ask, what is a lot? 4 A’s: We have no green light for specific details, the message is about having more contact and nearer by, like now. Telepathic, languages, which can be, communicate with us in the Higher Realms and also about appearances and with allowed more specific explanation. Me: You are from the Legion of Love and Light in the Higher Realms? And events will take place with noticeable changes? 4 A’s: This has permission to be confirmed and it is positive! With somewhat persistent confusion, but the Light is so vastly integrated, the Light, Light workers can continue the work that is now necessary, it will really show the intentions. Me: Any direction or indication? (This word I looked up later) It means: based on facts in their original context, generally useful and instructive, general valid. Me: It feels like a big reconstruction. 4 A’s: Thoroughly, through and through. Hold on and continue doing the good! Meditations, inner work, forming of togetherness, reforming of all what is possible, prayers, mantra’s, sharing in any way, it is all working. Earth and her inhabitants are really enlightening. The “grid” will be separated. Don’t think of drama, it will pass with loving full intentions. Time of choices, this will be made very clear, it is very serious. The option is sounds; tunes and tones, more can be heard than before. It will be more opened, be open, many portals, gateways, entry’s etc. and the Divine involved operations. This will / is all allowed to use, it will be in a reopened way. In other words it is coming closer together again. Our dear beloved ones as people on Earth, by the means of the most social element, Air. The sylphs but also other Elementals., but also many others, the expanding option is available, we are full of anticipation here in our own way. This requires great loving commitment and guidance from both sides. Do not be surprised if a bird enters with more easily understandable contact of a plant in the house of in the garden and also pets. If this turns out to be all right in harmony, love and balance, acceptance, and reinforcing solidarity, there will be more expansion. to be able to explain and try to explain well, to show, in their way to “elderly” that there are more things on and around Earth than the “normal” physical eyes can see. It means that the Holy Spirit has more space, breathing space and medium power available to introduce the other side of illusionary life. It is possible that this causes physical, mental, emotional effects. A type of absence other than deep meditation, we want to mention specifically and this can happen opposite to habit / use. The message is it will do you good! The comfort zone will change very quickly for some of you. Another important zone that will change is those of constant or excess waves / influences of fear. It will be replaced, in principle it is already, but now it will appear and remain more noticeable, clear. Then I receive: this is it, but we continue to pass on this type of messages, this is now the beginning of it. We cannot give time and data, it is meant that you learn, perceive, hear, sense when we are there again like this for editions of this types of messages. For everything else we will always be with you, we feel that you understand. Very kind regards and welcome to everyone, it is for everyone and we are full of joy and enthusiasm to continue! The element Air is the Breathe of God. We received it through God and also through the Elohim. It is one of the Creator’s gifts and also Air has a DNA code. Air has already contributed most to the processes of cleaning and healing and with regard to regaining harmony and rearranging. And to the wish of Mother Earth to minimize this as disasters. Air is also there as etheric Air in the cosmos. Energy that breathes in and out in the whole of Creation as people on Earth, but in other dimensions, all at once. In man, this takes place in the chest (cavity) there is breathing; from there to the blood circulation and from there the rhythmic arises. Perhaps you have heard or read about it that if you as a human being are placed in a very quiet (soundproof) space, you can hear the body. If we remain very silent about everything we see and in reality want to understand / remember, that is going inside, listening to the inner and learn to live with the experience (s), then we will be outside the Higher communication that is now on the moment on earth, hear the beautiful and harmonic musicality of the cosmos, the tones of origin from the Universe, but also the tones, sounds from the other kingdoms of nature on the earth itself. Musica. By vibrations of divers kind and frequencies via the element of Air, as main element for this. What lives is sacred by itself and is much more different that that we are currently observing physically and will be more filled with cosmic air. Posted on website English version: 10 January 2018. ANJA with Love and Blessings. Note: I made a picture to support it of the impression of the 4 A’s. Maybe you are wondering why they have wings? These are cosmic wings of Love which are propelled by Cosmic Air which move full of Love to get closer together. Note 2: The message from Archangel Michael is from the book “On wings of Light” by Ronna Herman, it is in the last message of the book.